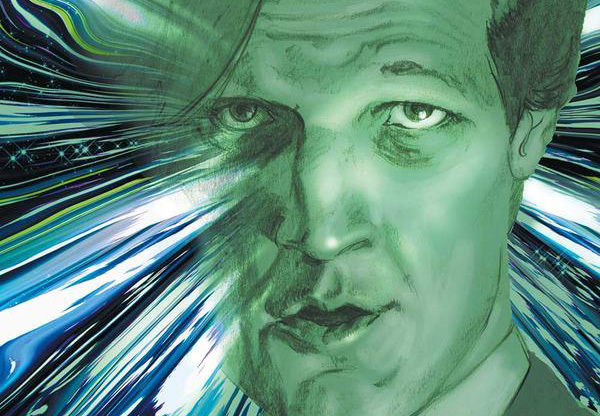 Doctor Who: THE ELEVENTH DOCTOR #2.13 Review @comicstitan | Warped Factor - Words in the Key of Geek. Tony will sleep when this arc is finished and not before. Take two singers. Two dancers. Two musicians. Two creative, expressive people of any kind. In fact, take three. Then four. Set them all working together, and what you’ll have might at first feel like chaos, as each does their thing, as hard and loud and bright and distinctive as they possibly can. But after a little while, you’ll notice something happening. The voices will harmonise, or creatively oppose in ways you never imagined, because you don’t have their instincts. The moves will stop being singular, will dance in some audacious way that serves the others, will inspire, push, drive the others on to new invention. The notes will find a rhythm that allows them all to shine, to specialise, to add their own distinctiveness to a new harmonious whole. That’s what happens with The Eleventh Doctor #2.13. 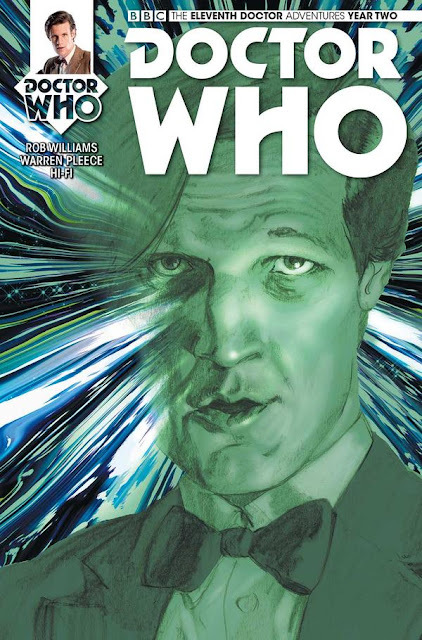 From a sombre starting place that adds Alice’s voice-over to the Eleventh Doctor looking at an increasingly-infected River Song in her stasis chamber, things go rapidly entirely tonto – the Doctor opens the Tardis door and for a handful of pages after that, you’d be forgiven for thinking artists INJ Culbard and Simon Fraser and colourist Gary Caldwell are out for blood and glory in this issue – they break out the ‘Exploding Cosmic Chaos’ section of their colour pallets and get stunningly busy – stars scream, paradoxes burn, the universe pretty much rips itself to bits, and you think ‘there’s no way anything as paltry as words could ever stand up to this. This is an issue that’s just going to be stunning to look at for thirty pages.’ A picture after all is famously worth a thousand words. Here it’s fair to say a picture’s worth a thousand worlds as the events of issue #2.12 have cosmically cataclysmic consequences. But you really should know better than to think anything as silly as that, because Rob Williams is on Word Duty, and he’s not a writer who’ll let the issue be all about the imagery this far into an arc, when there are great, impossible odds to calculate, stories to move forward, characters to explain and really speaking, a hell of a lot to do! Nor does he here – in fact, right from the off, that sombre section shows Williams too means business in this issue. It shows an Eleventh Doctor doing his occasional brooding thing, tapping into a fundamental characteristic of the on-screen version, that sense that somehow, right from the beginning, he was a Doctor who got things wrong, who let people down (from young Amelia Pond onward). In Let’s Kill Hitler, he spends some time showing us his guilt over all the people he feels he’s let down, almost like an updated version of the Fifth Doctor, unsure in his hearts that he’s entirely ‘fit’ to be the Doctor, but stuck with it anyway and doing the best he can. Here, that occasional moroseness comes through in Williams’ initial note, and then bang! Crisis, chaos, and the front of the Eleventh Doctor snaps immediately back into place, the cleverest life-form in the room, working things out, fishing in the streams of the universe, trying to understand, and getting there, whether anyone else is following or not. No. ‘Spoilers,’ as River would say, were she not in a stasis chamber getting somehow steadily worse from her infection with the Malignant. That one, you’ll have to buy the issue to find out. Suffice it to say, for an issue that begins with the Doctor in full-on mopey mode, and includes the potential extinction of the universe, by the end of it, we’ve had enough character and story development that the Eleventh Doctor’s relationships with almost everybody on board his Tardis have been altered pretty permanently. To find out how, you need to hop down to your comic-book store of choice – yes, genuinely, hop there. It’s an Eleventh Doctor thing. We hop to comic-book stores now. Hopping is cool – and get your hands on what is essentially a comic-book symphony waiting to take you on a ride to the end of the universe and beyond. Hop on down and get The Eleventh Doctor #2.13 today.